We are delighted to be working with John who is responsible for all the Coffee Birmingham branding. John is Birmingham based graphic designer specialising in all areas of design for print and branding. John works with corporate clients, both large or small companies, and has specialised in designing artwork for bands and venues. Tim recommended him to do the work for Coffee Birmingham as he does the design work for Tim’s instrumental band Rise. John is an avid tea drinker (!) and has designed branding for the Cuppa Tee t-shirt company. John is always looking for interesting new projects so he would love to hear from you. We are delighted to confirm Midlands Discovery Tours as a supporter of Coffee Birmingham. As part of our activities for Saturday 29th September, Midlands Discovery Tours will be running a special tour – more info to come! Midlands Discovery Tours is a small, independent tour company run by two Blue Badge tourist guides, specialising in providing professional and friendly tours throughout the Midlands. 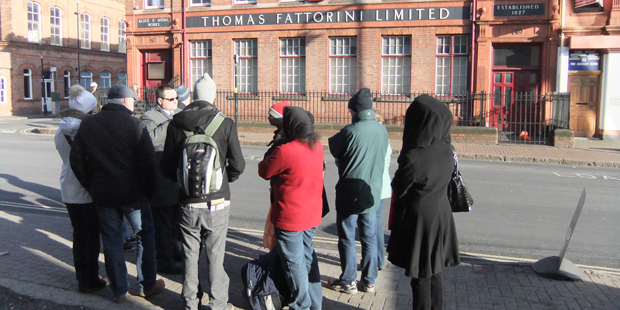 They operate a range of public walking tours in Birmingham every weekend of the year, with city tours providing a great introduction and themed walks exploring the city in more depth. They aim to provide both new visitors and lifelong residents with an enjoyable and informative experience of what our city has to offer. Alongside their public tours, they are available for private bookings for groups of any size and can tailor a tour to any requirements. They have worked extensively with student groups, community organisations, businesses and individuals and have run Birmingham Ghost Walks for the past three years, which operate twice a month in Birmingham and have expanded to Sutton Coldfield and Warwick, where we run tours every three months. We are so happy to be working with them because they really help people to discover and enjoy everything that makes Birmingham such a fascinating place, and they see themselves very much (and rightly so) in the role of unofficial ambassadors for the city. For these and many more reasons, they are an integral part of the independent business community. With thanks to Ian Braisby for his help. So ahead of tomorrow’s launch, we are very happy to announce Saint Caffe as a supporter of Coffee Birmingham 2012 – who will be another of our locations for #independentsday tomorrow and where you can also sign the Declaration of Independents. For anyone who lives and works in the vicinity of St. Paul’s Square, Saints is must-go location serving high-quality coffee from roasters Extract, alongside a quality selection of food and cakes, many of which are made in house. Saints is an open and welcoming atmosphere with sophisticated dector, and it is a good place to get on with work or relax with a book. Many thanks to Geoff and his team for being so enthusiastic and supportive of Coffee Birmingham. So our locations for #IndependentsDay are Six Eight Kafe, Saint Caffe and Urban Coffee. …. And our final location for Wednesday’s launch will be announced later this evening. Announcing Six Eight Kafe as supporter and one of the independent locations for Wednesday’s launch. We are delighted to announce Six Eight Kafe not only as a supporter of Coffee Birmingham 2012 but as one of the locations for this Wednesday’s launch and where to sign the Declaration of Independents. Six Eight is also host to art exhibitions, numerous live events from dancing to yoga and from film nights to various workshops. Many thanks to Dav, Hannah and all the team for the invaluable support on Coffee Birmingham. Follow them on twitter @sixeightkafe. Another independent location for Wednesday and supporter to be announced later today. Announcing Urban Coffee Company as a Supporter and another of our locations for Wednesday’s launch. More brilliant news. We were delighted to announce Urban Coffee Company as a supporter of Coffee Birmingham 2012 and are going to be frequenting both their Church Street and Jewellery Quarter locations for this Wednesday’s launch and where also to sign the Declaration of Independents. Urban (as it is affectionately known) will be celebrating their third birthday this August and have proudly flown the flag for Birmingham’s independent scene. Their three coffee emporiums (Church Street, Jewellery Quarter and their pod at the Mailbox) serve glorious coffee roasted by Union Coffee and delivered by their team of very friendly and talented Urbanistas. At all their locations, Urban is also home to numerous events including live music Friday, book and knitting clubs, yoga clubs, Birmingham Entrepreneurs and the monthly #JellyBirmingham co-working meet up. So in addition to Six Eight Kafe, we will be at Urban’s Church Street and Jewellery Quarter emporiums on Wednesday. Come along and support.